We’ve had extraordinarily benign weather for the last 10 days. Daffodils are blooming – normally they don’t start to flower until late March in this part of the world – and the garden is full of birdsong. 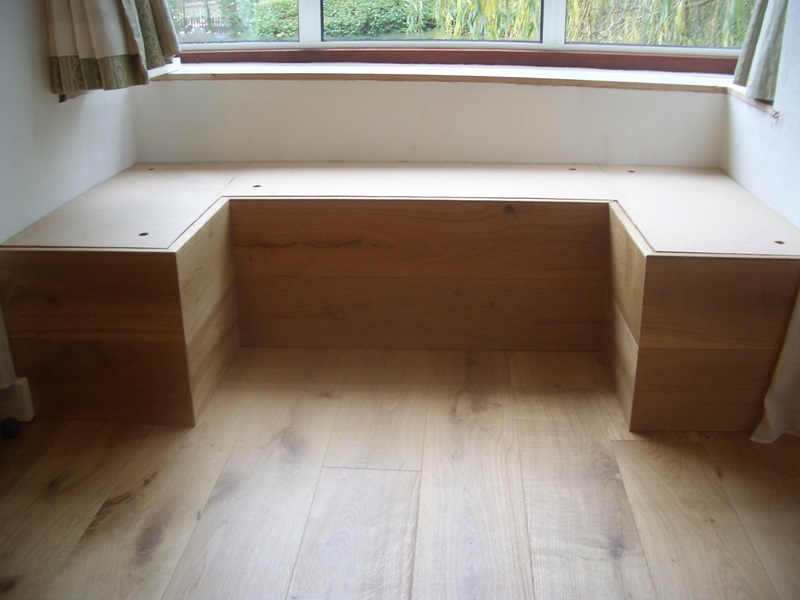 All of this unseasonal warmth and sunshine has motivated me to make a start on the cushions for our new window seat, because I’d like to be able to use it on sunny days. 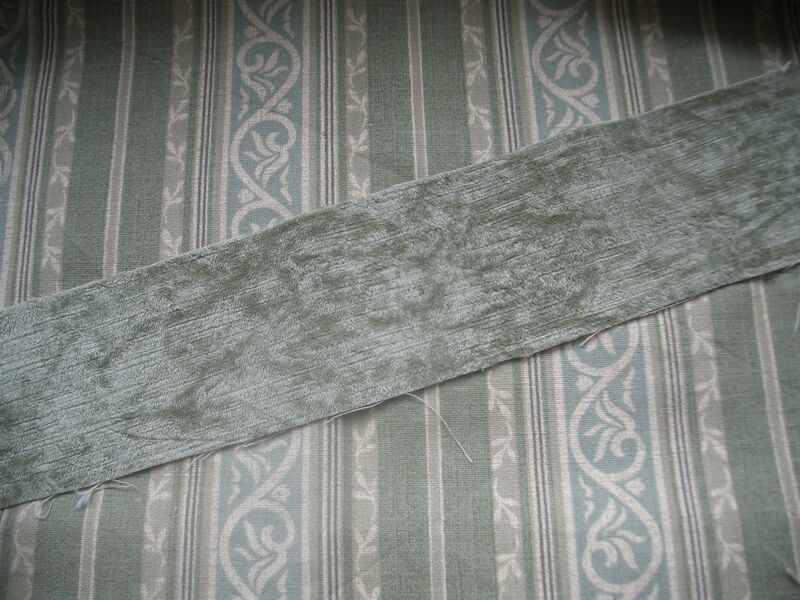 I bought a remnant of pale green velvet from The Shuttle just before Christmas. It’s just the right shade to go with the remains of the striped linen union I used for the curtains in that window, which has been stored on a cardboard roll since about 2001 or 2002. The leftover curtain fabric is enough to cover one side of each box cushion but not enough for the other side or the boxing. I thought I had plenty of the velvet, but I’d forgotten how much fabric piping takes up when you cut the strips on the bias. Having cut everything out I have just two small triangles left, and it took an awful lot of planning to fit everything in. I didn’t make life easy for myself by choosing a fabric which not only has a pile, but also a slightly ribbed appearance, meaning it has an obvious direction and every piece had to be cut with that consistent direction. and then applying it to the top and bottom panels of each of the three cushions. But I think the end result will be worth the effort, I like the contrast between the furry piping and the smooth linen union. On the subject of cushions, I’ve continued my experiments with onion skin dyeing. The aim is to match the colour of the cushion cover fronts I knitted recently. I want to make use of some white cotton fabric that I already have for the backs, rather than buying yet more because, let’s face it, I already own more fabric than is good for me. Ordinary brown-skinned onions were giving an orangey colour so I switched to red onions. 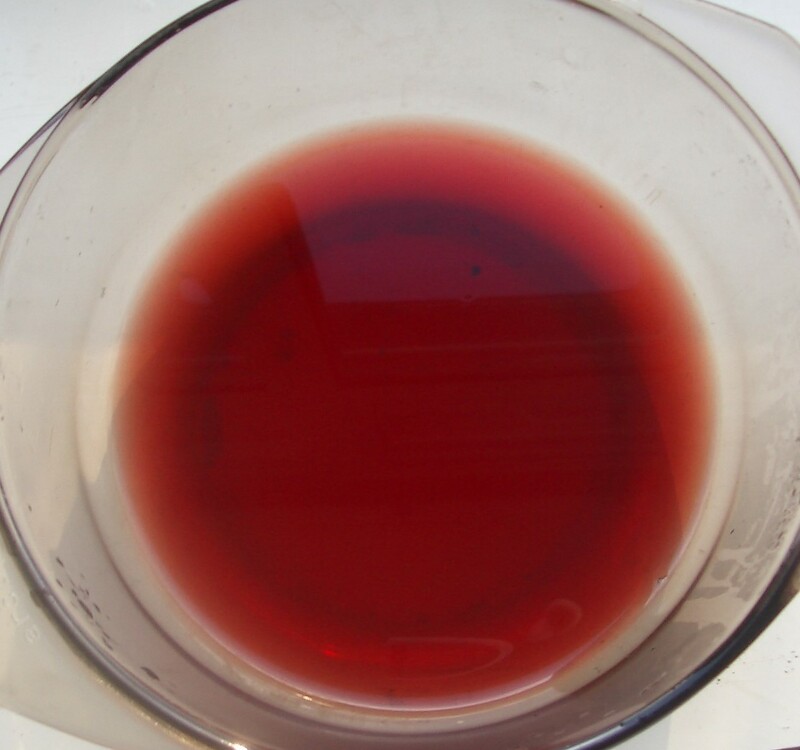 The dyebath was quite impressively red but the colour it gave was a good, deep brown. That’s it top right in the photo below. I will definitely use this brown again, but it is too deep a shade for my cushion backs. I diluted it right down for the next attempt, which is top left above. That, I decided, was close enough – cream coloured without any of the orange tint produced by the brown onions on the swatch at bottom left. I dyed this small swatch in a glass bowl in the microwave, but neither the bowl nor the microwave was big enough to accommodate the fabric for two cushion backs. (It’s important that the fabric has plenty of room, or it will dye unevenly.) Instead, I used my largest saucepan on the stove. 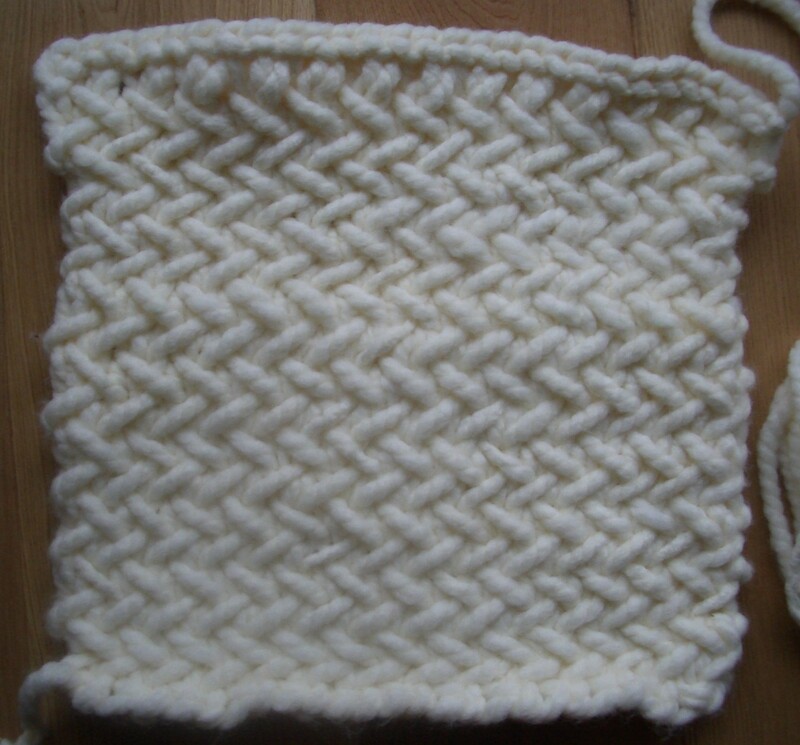 The result is not great – the colour just isn’t the same as the swatch and doesn’t look right against the cream yarn. The reason might be that the red onions were a different variety from the original ones, or were grown in different soil and so picked up different minerals, but I suspect that the main cause of the colour difference is the aluminium base of the saucepan. Glass vessels won’t taint the dyebath, and stainless steel is safe too, but my pans are stainless with aluminium bottoms. I should have thought of that. Now I don’t know what to do. I might try bleaching the fabric with ordinary hypochlorite bleach to see if that removes the colour and then start again, or maybe using very dilute bleach to see if it will end up a better shade without the need for re-dyeing. The problem with dyeing the fabric again is I don’t have a large enough inert vessel to do it in. I may have to see if I can borrow a fish kettle from someone. I knitted a sample in stocking stitch and was relieved to see that the browny-beige mould spots that were so apparent on the outside of the cone were not nearly as obvious once they had become part of a knitted fabric. In part that must be because a spot extends across several adjacent portions of yarn, and once they are separated the discoloured area on each is much smaller. Also, I think the mould was brushing off the fibres as it passed through my fingers. 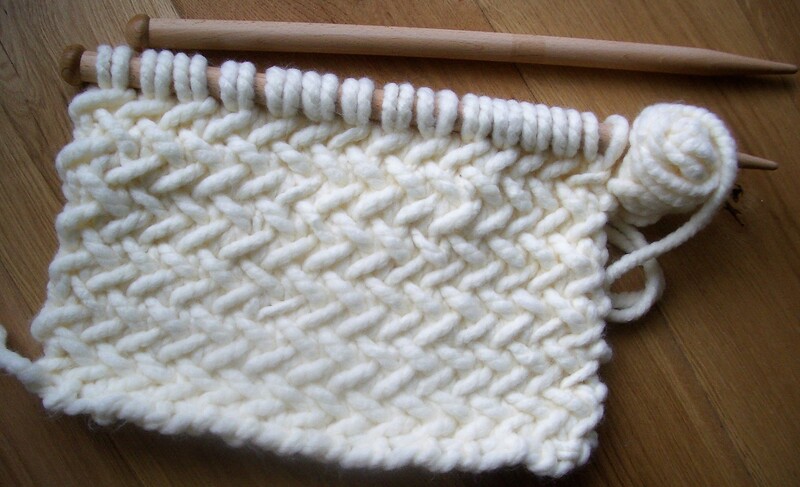 In the past I’ve often knitted from aran patterns using two ends of 4-ply and obtained the correct tension. In theory 4-ply doubled should produce a double knitting weight, but in practice the two strands don’t fit together as closely as they would if they were plied by twisting them around each other, which means the resulting yarn is quite lofty and warm and more like an aran weight. I continued my swatch with a doubled-over loop of yarn to see what it would look like in a rib, and I was happy with the result. Examining it, I was reminded of a pattern that’s been on my “to do” list for a while, a big ribbed cardigan called Flaum. I measured the tension of the ribbed portion of the swatch and found it was very close to that recommended for Flaum, which seemed like an omen; this yarn was calling to me to be knitted up after three and a half decades on the shelf, and the name it was calling was Flaum. The only problem is, do I have enough? Frankly, I’m not sure. The spinner whose name is on the label on the cone ceased trading in 2000, but the count is given as “2/82/9 Nm”. Now, Nm means the metric system, based on 1,000s of metres per kilogramme (or metres per gramme). But normally there would just be two numbers separated by a slash, and the first is usually the number of metres per gramme of each ply while the second is the number of plies. My initial guess for this yarn was that the first two numbers were the other way round and the third could be ignored, in which case it is a 2-ply yarn (which it is) with each strand having a count of 82,000 m/kg, or 41,000 m/kg for the two together. Which means that 100g of the yarn would be 4,100 m long, or about ten times as long as the average 100g ball of 4-py sock yarn. Clearly that can’t be right. So maybe I need to divide by the 9, giving me a length of 4,556 m/kg. That does at least sound feasible. I remember when I first bought this yarn that I was advised to use a looser tension than normal, because it would fluff up (or “bloom”) and fill out the knitted fabric when the lanolin was washed out of it. I’m assuming that, in its current, greasy condition it’s a relatively skinny 4-ply, albeit one that should be knitted on the usual UK size 10 / 3.25mm needles, which makes a yardage of 456 metres per 100 grammes just about believable. I could wind 50m or so around a yardstick and then weigh it, but I’m not convinced that 50m (about 2% of the total) would be sufficient for accuracy given my old-school kitchen scales, which are of the traditional balance type with weights. 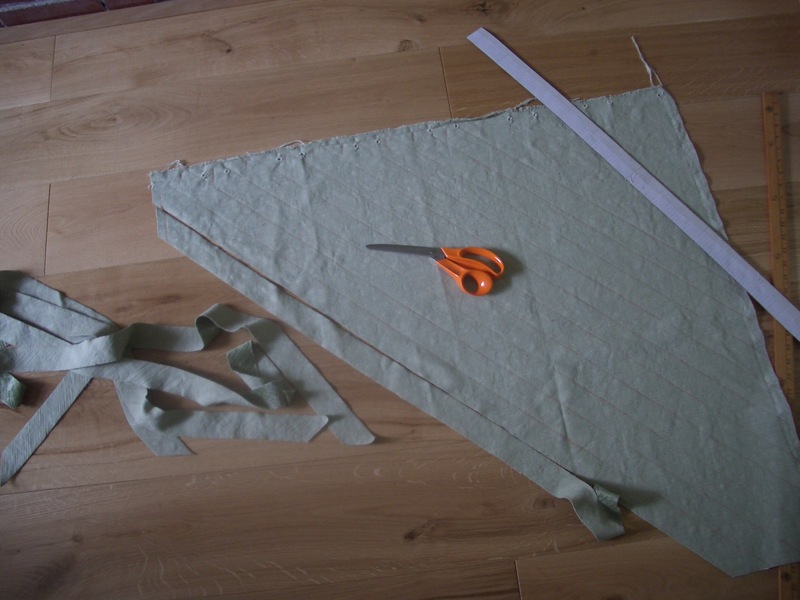 But one check I have done is to count the wraps per inch, which is 19-20. 4-ply yarns are generally around 14 wpi, so yes, this is definitely at the skinnier end of the scale, in its “in the grease” state at least. Assuming I do indeed have the length of yarn I think I do, there should be just enough for Flaum. It’s knitted top down so I could always make the hem and the cuffs a different colour if I had to. I’ve wound the yarn off the cone into two balls – there was a break part way through. The mould was only on the surface layer and I may never get down as far as the yarn that was on the outside of the cone. Flaum it is then. That should keep me out of trouble for several weeks. I’ve even made a start. My supersized-yarn cushion cover fronts are done, now I need to make the covers up. I’m trying to use up stash so I’d rather not buy any fabric for the backs. In my stash I’ve found a heavy cotton with quite a coarse weave which I think would do very well, if only it weren’t stark white. 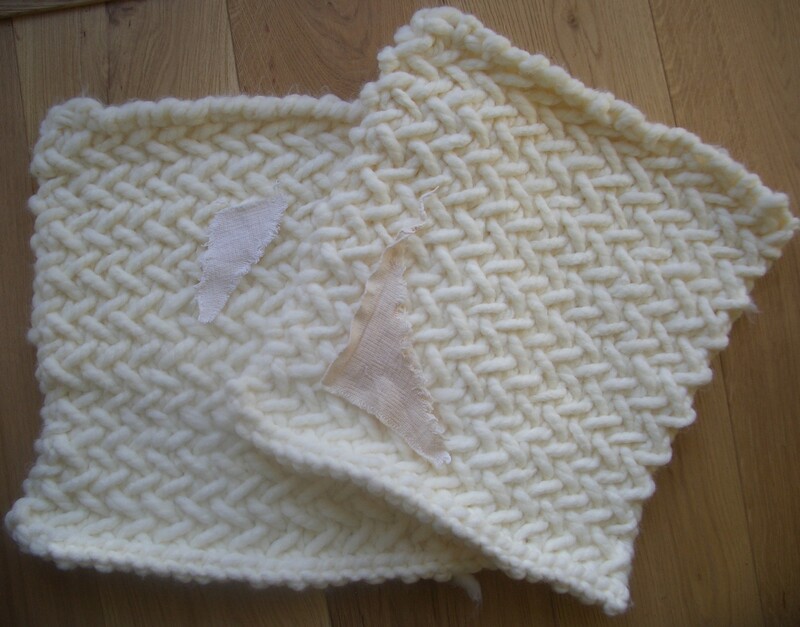 Put against the cream coloured knitted fronts it looks completely wrong. When I was little, at Easter my mother used to wrap our eggs in onions skins before boiling them, and they came out an interesting yellowy-brown shade. 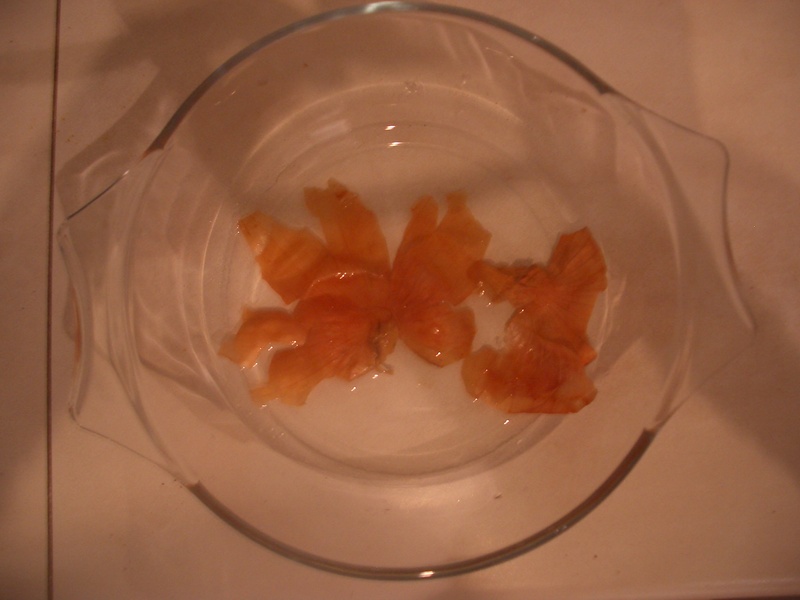 Sometimes we would try masking off a chick or bunny shape with aluminium foil before wrapping the onions skins around the egg, and that wasn’t very successful, but that’s another story. The point is, if the papery outer skin of an onion is capable of turning a white eggshell brown after a mere five minutes of boiling, then perhaps onion skins will tone down this white fabric to more of an off-white that won’t look quite as discordant alongside the cream yarn. I looked online and there are plenty of tutorials on how to dye with onions skins, and some very attractive shades can be obtained. I’m tempted to have a go with wool yarn some time, but for now I need to concentrate on this cotton fabric. 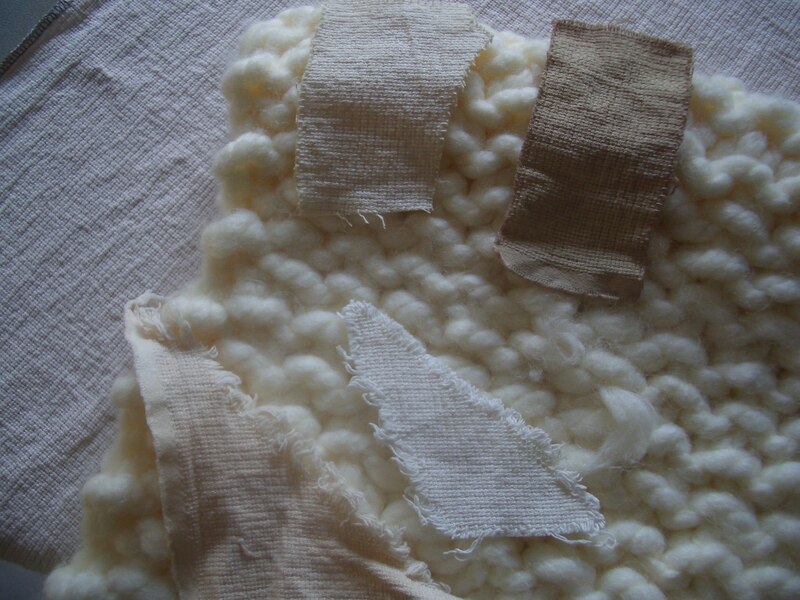 It appears that a mordant isn’t needed when using this dye on cotton. I did a test run, just using the skin of one onion (the English type, not Spanish or red) and a scrap of the fabric. Next I wet the fabric (it had already been washed – I always wash cotton when I buy it, to shrink it and to get rid of any residual oils or waxes), put it in the dye liquor and blasted it for a couple of minutes in the microwave. I left it in the dye bath to cool down. When the fabric swatch was cool and I removed it to have a good look at it, I was surprised how orange it had become. 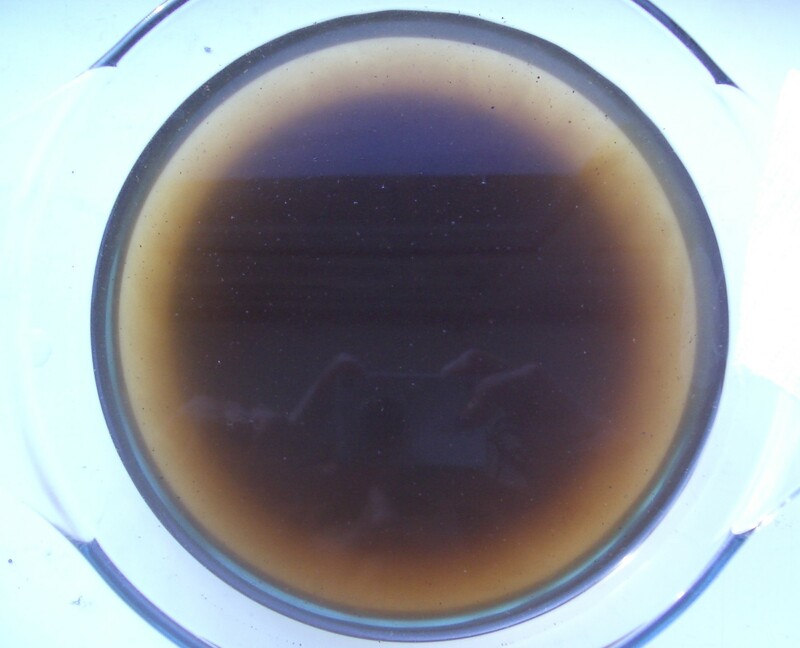 I rinsed it under the tap and not much dye seemed to come out, so I threw it in the washing machine with a load of towels, fully expecting it to come out white. It didn’t. Whatever the chemical compound in onion skins is, it’s a dye that is fast to washing. Clearly, if I use onion skins for my cushion covers, I’m going to have to be careful with the strength of the dye bath. I guess there’s no problem with starting with a weak ratio – perhaps two onion skins for the pair of 17” square cushion backs – and then overdyeing if necessary to get a deeper shade. But what worries me more than the depth of colour is the orange hue. I’m hoping that it will appear less orange if the intensity is reduced. My next experiment was using coffee grounds. Although the colour of the dyebath was deep, the fabric swatch came out pale and almost all of the colour was lost when I washed it. 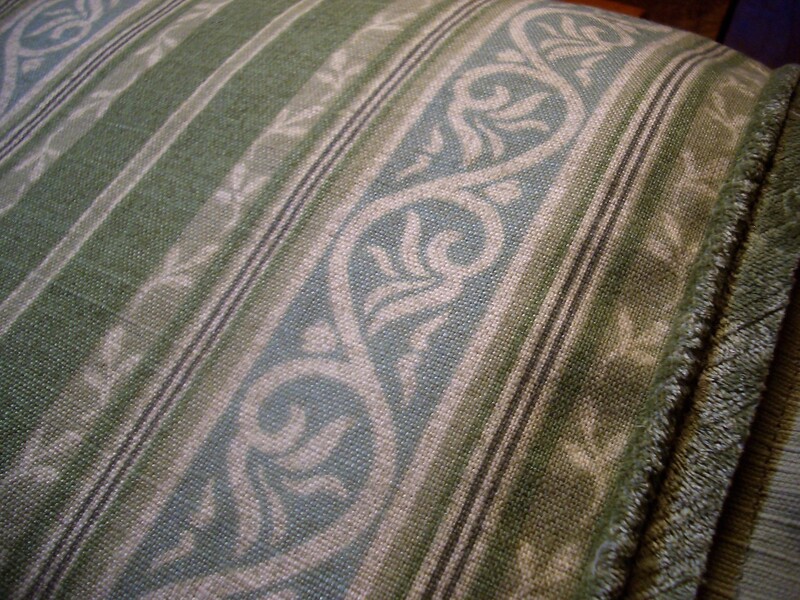 The photo below shows the two cushion fronts with the coffee-dyed swatch on the left and the onion-dyed one on the right. Neither is right, I need to get a little more yellow into the shade. Maybe I ought to experiment with turmeric, a yellow vegetable dye that also requires no mordant. The only problem with that is turmeric is notoriously fugitive, and once the knitted fabric is sewn to the cotton backs there’s no way I can re-dye the cushion covers if the colour fades. I was lucky enough to receive a pair of huge (20mm diameter) knitting needles for Christmas and some equally huge yarn. I have tried giant crochet before, again after being given the wherewithal as a present, but never supersized knitting. I struggled to control the needles at first, the process of knitting with needles and yarn that are so large and heavy is quite awkward. But I was soon on a roll and loving the chunky, highly textured look of the fabric. Even moss stitch looks really interesting at this scale. I’ve been keeping an eye out in fabric shops for something from which to make a pair of cushion covers, in a neutral colour but textured, without success. As my trial swatch of this Group Hug yarn from Hobbycraft grew, I suddenly realised that it would make a fine cushion cover. 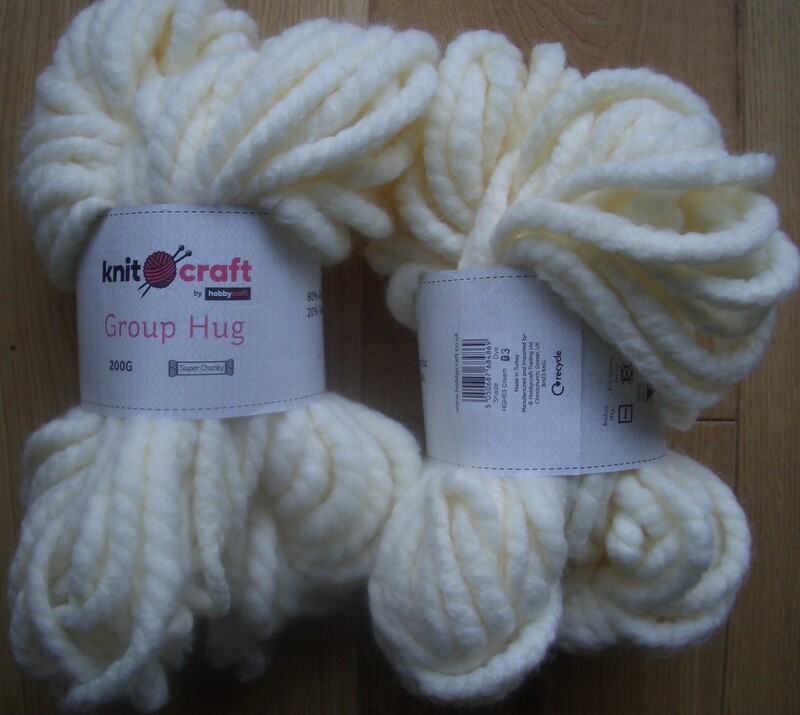 OK, it’s a very pale cream, which may not be the most practical of colours, but it is washable. I looked about for a stitch that would produce a denser fabric than moss stitch with these needles – going down a size isn’t an option when your next largest needles are half the diameter – and happened upon a pattern called Fisherman’s Pillow which uses a herringbone stitch that involves slipping stitches and then passing them over (PSSO). I knew from the Passover Hat I made recently that this would produce a relatively tight tension, and so it proved. I’m basically using the Fisherman’s Pillow pattern, but adjusted to suit the size of cushions I have and the tension I’m getting with my yarn/needle combo. 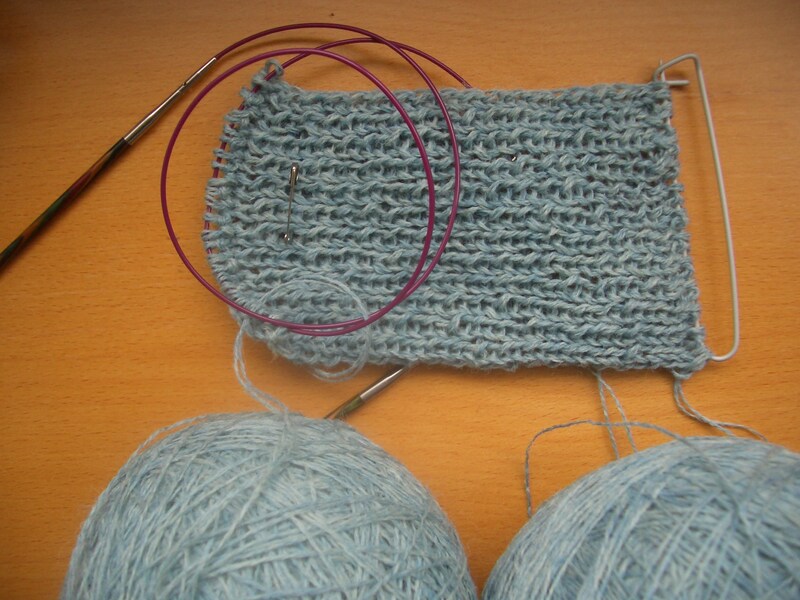 The knitted fabric is so thick that I’m only knitting the front of each cover, I’ll use woven fabric for the backs. The work grows quickly, which is just as well because I keep having to put the needles down for a rest now that I have almost a whole 200g ball in play. Not all of my crafting endeavours go to plan. I tend not to mention the pear-shaped ones in this blog, I’d rather focus on the things that turn out reasonably presentable and/or useful. But we can all learn from our mistakes, and sometimes we can learn from others’ mistakes too. So I’m sharing not one, but two recent disasters. 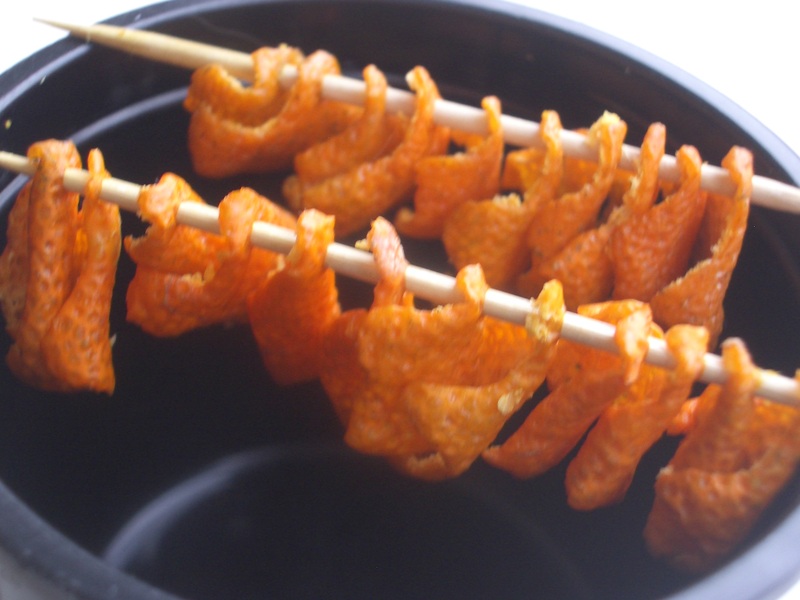 Firstly, I was seduced by an episode of Kirstie’s Handmade Christmas into drying citrus peel. The Brits amongst you may have seen the programme which showed attractive Christmas tree decorations made from orange peel. How wonderful, I thought, to hang something on the tree that smells delightful and looks charmingly rustic but is made from skins that would normally be thrown on the compost heap. 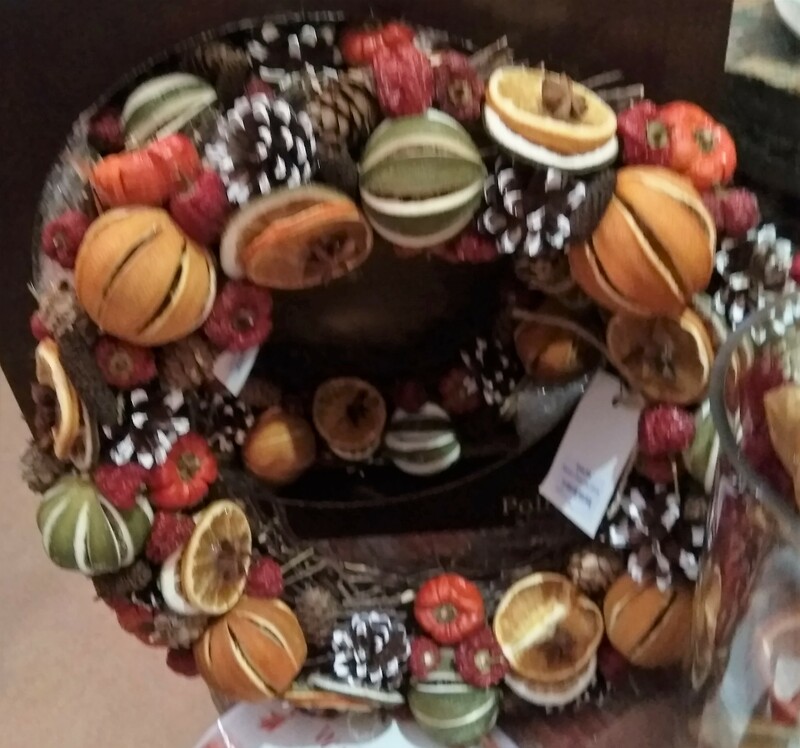 I’d already seen some wreaths that incorporated dried oranges in a very posh shop and decided I’d have a go at drying whole fruits like this for next year. 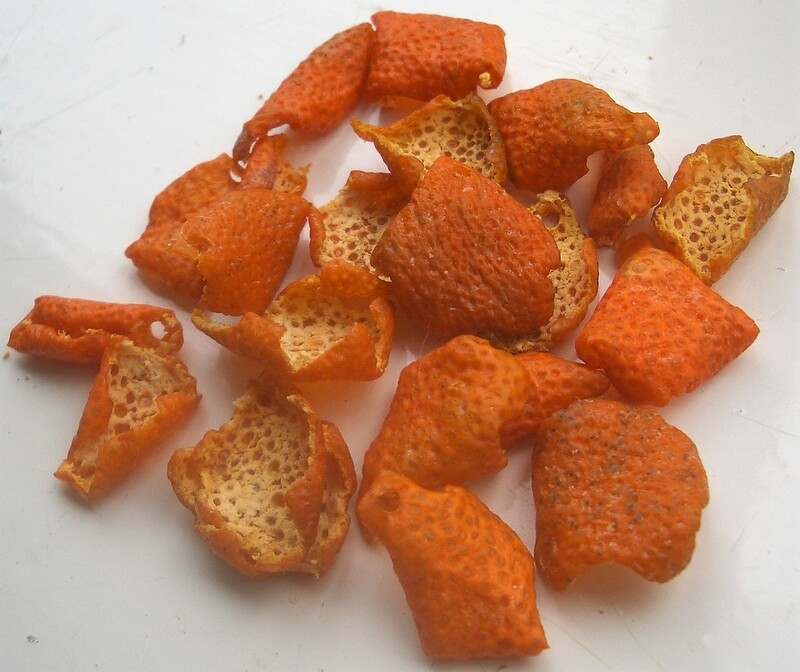 Having a dry run with mandarin peel, based on the TV programme’s instructions, seemed like a good idea. I carefully cut out 20 stars using two different canapé cutters, pierced a hole in each with a cocktail stick and then hung them up to dry. Although they are tiny, I thought they would make nice additions to an evergreen wreath, perhaps hanging from short lengths of twine or fishing line. As you can see, the stars have shrivelled up and are totally useless for any sort of decorative purpose. I briefly considered trying to iron them flat before concluding that ironing citrus peel is several steps along the route to madness, along with ironing your own hair à la Bridget Jones. If I do this again I will use larger shapes cut from orange peel and try pressing them in the “old school” way – between sheets of blotting paper under a heavy book – to keep them flat. I have no idea if that will work, but clearly hanging little shapes up to dry doesn’t. Now, how to get it off? I pinched a small plastic ball from the cat to use as a mould. Petroleum jelly is generally recommended as a mould release agent, but I didn’t have any so I coated the outside of the ball with cooking oil instead. This was a mistake. 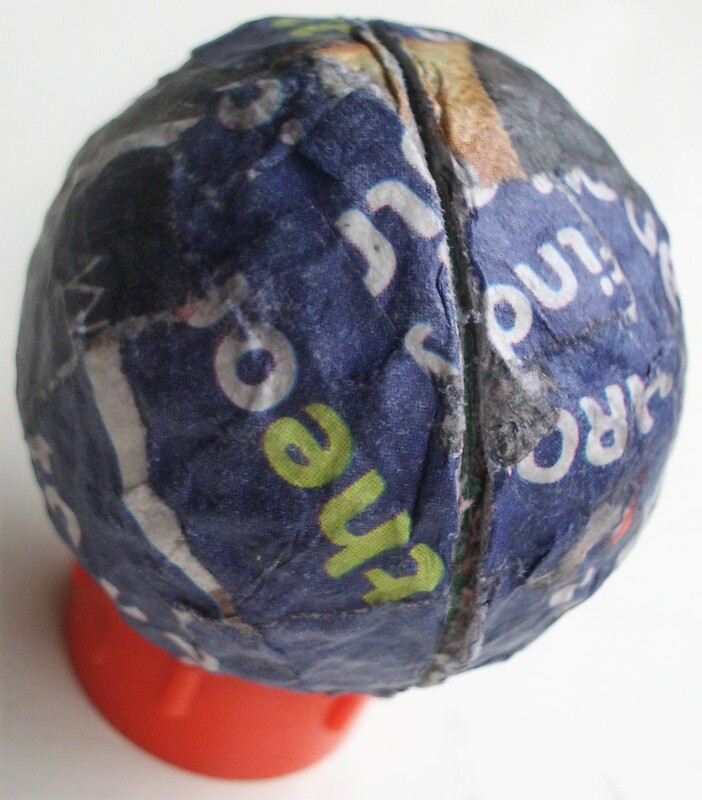 After plastering the ball with several layers of small pieces of paper soaked in heavily diluted PVA and letting the layers harden, I cut around the equator and tried to remove the paper shell in two halves. 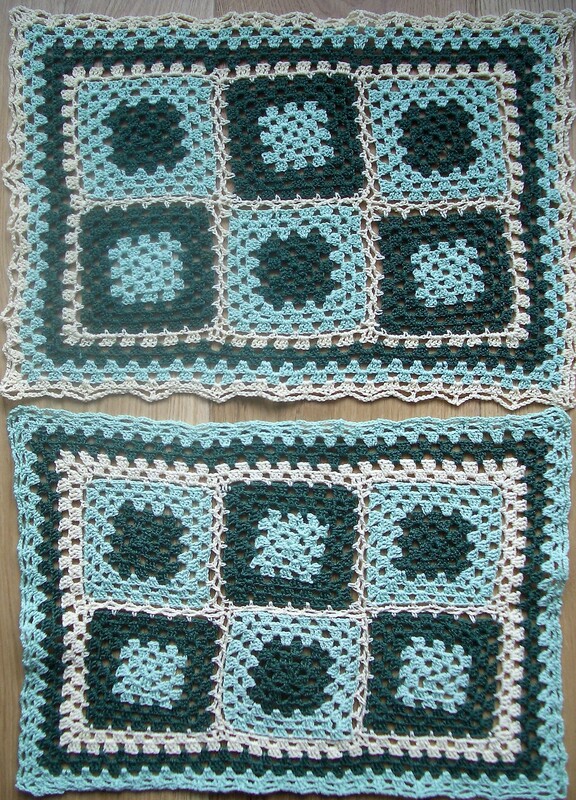 My only modest success in the last week has been completion of the second granny square tray cloth. It’s the upper one in this photo, with the yellow edge that’s still wiggly from being blocked. They may not be the most sophisticated examples of the craft of crochet, but the slightly hippie vibe they give off cheers me up every time I see them. There are lots of things I’d like to learn to do in 2019, many of them craft-related, and there are various crafting ideas I’ve had but haven’t taken to completion (or even started, in some cases). So I thought I’d set them down here in black and white to shame my future self into getting on with them. Well, that should be enough resolutions to keep me going for a while. 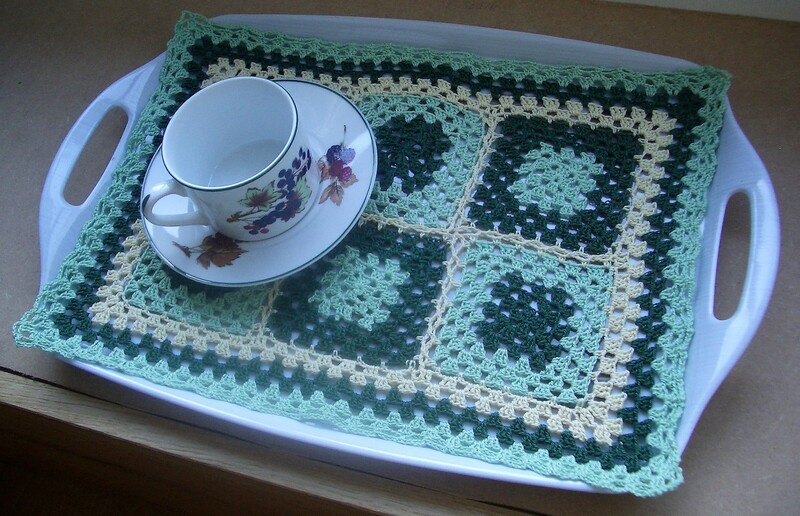 As for now, my first crocheted tray cloth has turned out reasonably well after its blocking. And I’m well advanced with its twin, although I’ve just had to pull out three of the outer rounds because I ran out of dark green shortly before the end of the second one in that colour. Instead, I’ve opted to have just a single yellow round before the dark green ones, and then I’ll add another single yellow round after I’ve worked a pair of light green ones. My tray cloths will only be fraternal twins, alas.